This is one of the illustrations for an article: “What have you done with this man?” that I’ve just posted here on my blog, edithohaja.com. So, what is it about? Many of us were born into Christian homes. We have heard of Jesus and we may have read some of the claims He made about Himself in the Bible but we feel He was just a great man, perhaps, even a great prophet like the prophets and masters of other religions. We are not confident enough to acknowledge His unique place in history and hand over the reins of our lives to Him. The rest of us may have been born into other religions or none at all. We may never have heard the gospel clearly stated to us. We may have heard of Jesus as a historical figure but we may not have been informed or we are doubtful of his Messiah status. This article isn’t preachy in the conventional way. Rather, it presents the testimonials given about Jesus by sone great men in history and now – scientists, statesmen, even atheists, the kind of people that modern man (referring to you and I) often feels comfortable with their rational approach to issues. I hope that in reading it, you will reinforce your belief in Christ or be moved along into embracing a faith in Him that is built on truth as the case may be. 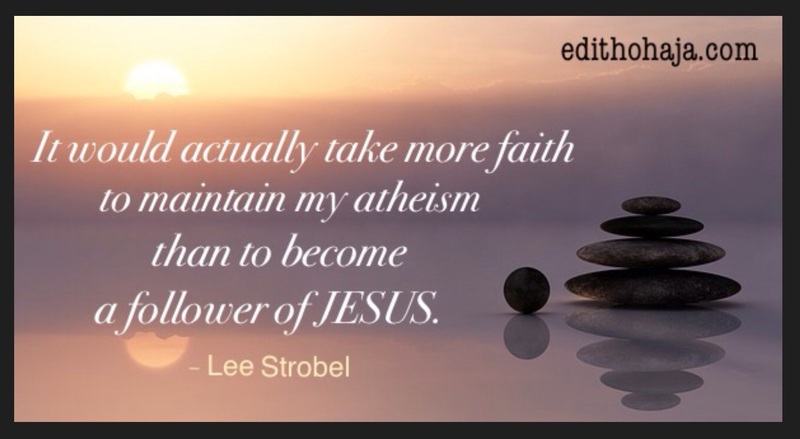 The article was written by a fellow blogger from the United States, Dave Maynard, who himself was trained as a scientist and has spent about four decades critically studying and amassing evidence that validates the Christian faith and answers knotty questions of faith. He presents these at his website, BSSSB-LLC.com. Read this article now and keep visiting the blog (edithohaja.com) to be encouraged, entertained and strengthened through the many inspiring and uplifting articles available. Better still, subscribe to get the blog posts in your mail. Subscription is free. You are blessed! Religion does not really matter. if you are a Christian, serve God as a Christain and if you are a Muslim serve him as a muslim as long as you serve him in spirit and in truth. Sorry to burst your bubble, dear! The faith you follow matters a lot. I believe that Jesus alone is the way to the Father. It's only through Him we can become sons/daughters and friends of God. Other religions keep worshippers as just that and servants, no personal relationship with the Creator. Often, He has to be approached through a myriad of lower deities. Not cool at all! Plus, you can't escape punishment for wrongdoing in lots of them. That is why some of them teach about karma and reincarnation. If you don't finish paying in this life, you come again. But for us, the blood of Jesus paid our debts. Punishment is not totally escaped but there is redemption and nothing is irreversible. Bless you! The doubt on the existence of God is not only fallacious but unfounded. At various times in history the great philosophers that questioned God's existence have in one way or the other been revealed through the unction of the Holy spirit that indeed there is a CONTINGENT being. this is the term used by most of them to avoid totally buying the idea of a God. and as time passed, newer generation of philosophers started using the word ESOTERIC to refer to religion, especially Christianity, saying that religion shouldn't be tackled with philosophical thoughts. So I believe That there is someone up there overseeing the affairs of men, we call him GOD and his signs and wonders still lives among us and speaks well of him. the word of God is the greatest treasure one can have. This article really reinforced my belief in Christ, not only as a historical figure but the power backing his prominence. I an blessed by this piece. Thank you so much. What matters is believing that Jesus is the Son of God and serving him. Serving Jesus is an amazing thing to happen in your life because your life will never remain the same. God is the light and the truth just believe and trust in him, let him be your first lead in life and your life will never remain the same. Obeying his commands and gospels your life will never remain the same.